ONEIDA, TN - Be a part of Big South Fork National River and Recreation Area’s fourth park-wide challenge event! 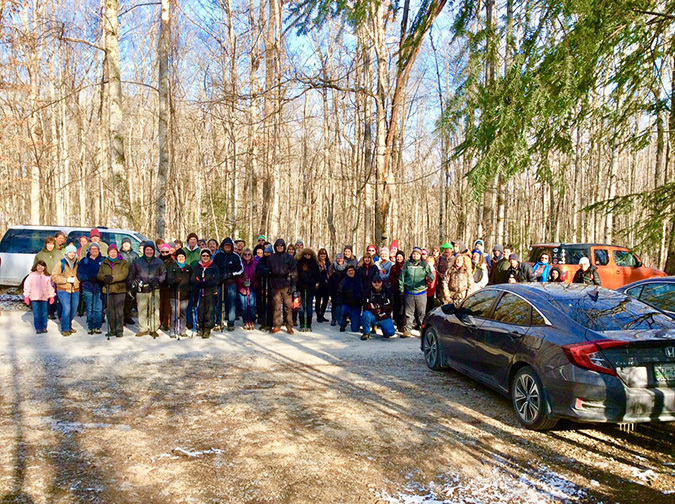 Join a ranger-led healthy hike and earn 12 points towards the new GO Big 2019 Challenge. Meet a ranger at the Oscar Blevins Farm Loop Trail Head off Bandy Creek Road (F Loop) at 10 a.m. (ET) for a 3.7 mile easy to moderate hike. Oscar Blevins Loop is the perfect trail for the whole family to enjoy beautiful rock formations, a wet weather waterfall, historical remnants of early settlements, and the Oscar Blevins Homestead. Dress warmly, bring water, snacks, and your GO Big 2019 Challenge Booklet, and wear comfortable shoes. Don't forget to bring that well behaved dog; however, leashes are required. The GO Big 2019 Challenge is a year-long, park-wide event designed to motivate visitors to go out and explore their park, even after dark! Participants will earn points by answering questions about the nature and history of the park that will require exploration in search of site-specific information. Some answers may even require a photo to be taken. Points will also be given for miles hiked, biked, paddled, or equestrian-ridden, so you can get started today! Booklets need to be turned in to Bandy Creek Visitor Center by December 1 to compete for an award at the GO Big 2019 Celebration on December 14.